There are some medical conditions which can disqualify otherwise eligible people from serving or even enlisting in the U.S. military. Other conditions which may affect the ability to perform duties as a soldier, Marine, sailor or airman may not be as apparent. 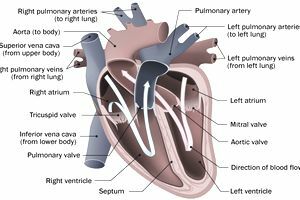 Here are some of the medical conditions related to the heart that may preclude you from serving in the military. These get a bit technical, so check with a medical professional if you're unsure. And it's also a good idea to ask your recruiter for any updates to this list. Current or history of all valvular heart diseases, congenital or acquired, including those improved by surgery, are disqualifying. Mitral valve prolapse or bicuspid aortic valve is not disqualifying unless there is associated abnormally high heart rates (tachyarrhythmia), improper valve function (mitral valve regurgitation), narrowing of the artery (aortic stenosis), insufficiency, or an enlarging of the heart (cardiomegaly). Current or history of abnormalities of the arteries and blood vessels, including, but not limited to aneurysms, atherosclerosis, or arteritis, are disqualifying, as is a current or history of hypertensive vascular disease. Elevated blood pressure defined as the average of three consecutive sitting blood pressure measurements separated by at least 10 minutes, diastolic greater than 90 mmHg or three consecutive systolic pressure measurements greater than 140 mmHg is disqualifying. History of pulmonary or systemic embolization, and current or history of peripheral vascular disease, including, but not limited to diseases such as Raynaud’s Disease where blood flow is restricted or decreased to the digits causing obvious discoloration, are disqualifying. And finally, current or history of venous diseases, including but not limited to recurrent inflammatory issues that cause blood clots to form and block one or more veins, usually in your legs (thrombophlebitis). Thrombophlebitis during the preceding year, or any evidence of venous incompetence, such as large or symptomatic varicose veins, edema, or skin ulceration, also is disqualifying.